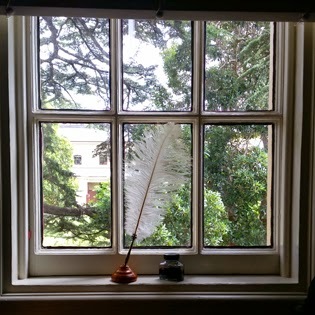 Earlier this year I had been looking at the courses and services offered by Writers Victoria because I’m starting to want to focus on my writing with a greater sense of purpose. Often new writers are given the advice that if you want to get good at writing, then write. A lot. Just keep doing it. So I’m doing that much. But then the occasional bit of coaching isn’t going to hurt either. 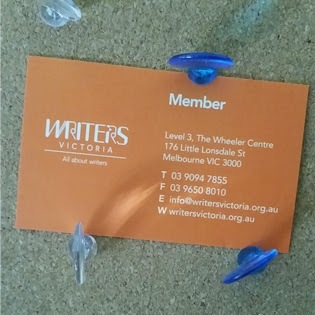 And even though I’d worked out that if you paid for membership to Writers Victoria you would only need to do two courses to have made it worthwhile in membership savings, I had thought ‘that’s something to keep in mind,’ and put the thought aside. Then, unbeknownst to me, came my brother’s request for gift inspiration. My lovely partner, remembering my musings, suggested that perhaps membership would be worth considering. My brother, who was more than thrilled at the chance to support me in my writing (only the week before he had offered to read drafts and give feedback) banded together with my other brothers and sisters and bought me membership for Writers Victoria. It was a lovely gift, and I was also moved by my partner’s thoughtfulness in suggesting it. I had not even thought of it as a gift. His other suggestion was Cards Against Humanity, which (while entertaining) doesn’t really help me better myself. And as my family went with the practical, helpful gift, it left the amusing game to be gifted by my partner. Win-Win. So, now I have my membership card on my recently acquired cork/motivation board, directly above the computer screen, staring at me for all the hours I spend here working, and I got to thinking. Maybe I should make use of it and book into some courses. So this morning I have done just that! I am now scheduled to expand my mind in May on the matters of Writing for Children and Young Adults. And as I’ve booked two courses I’ve now earned back the cost of the membership, which I didn’t pay for so it has very practically assisted me. Hopefully I’ll do more throughout the year, but I’m glad that I’m booked in and good to go with at least two. When I mix that with the gift that our other good friends gave me for my birthday – a classic writer’s tool – I’m starting to think that I truly am a real live author! And one of these days I’ll even be published elsewhere than this blog! Well, I ain’t gonna get there if I don’t keep working at it. Wish me luck! ‘The Printed Word’, here I come!